Having spent four years introducing gig-goers to the finest, most eclectic acts from the North East and beyond, Endless Window are preparing to rein in operations and enjoy a well-earned breather. First though, there’s the small matter of their annual festive fundraiser, which this year sees proceeds donated to mental health charity Mind. Staged at spiritual home The Cumberland Arms on New Year’s Eve Eve (Sunday 30th December), Festive Window’s four-strong line-up pairs an old favourite with three standout acts who’ve graced EW bills over the past 12 months. Topping the pile are Richmond’s Ceiling Demons, an A-grade headliner who’ve thrilled previous audiences with heartfelt, hook-laden alternative hip-hop, delivered with a verve and exuberance that’s typically unparalleled. This time, though, they can bank on a run for their money courtesy of formidable Hartlepool-born, Leeds-based electro newcomer N/\L/\, who’s stolen previous nights with her brash technicolour beats and insatiable lust for performance. 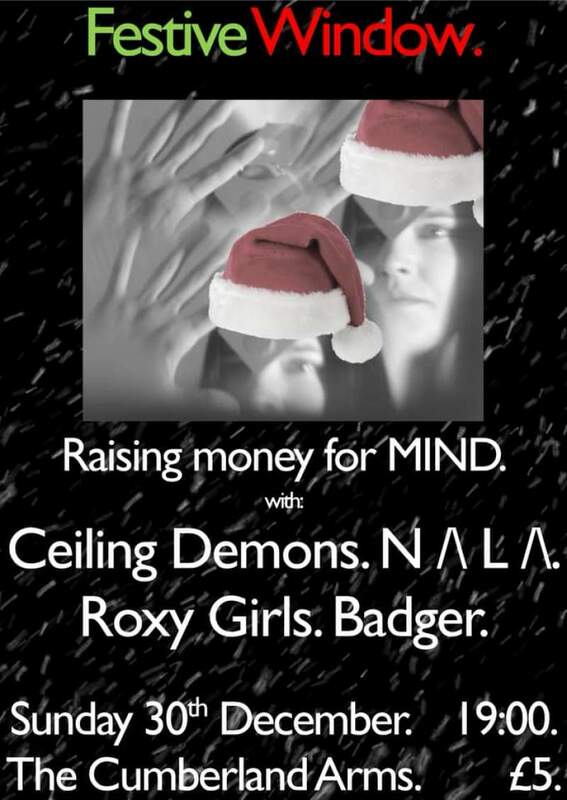 There’s also an appearance from Sunderland’s Roxy Girls – whose taut, angular post-punk grows more proficient with every show – while early birds will be treated to charismatic DIY rap from Newcastle duo Badger – hot on the heels of their debut single, Deepminded. Oh, and let’s not forget the customary EW DJ set… Rest assured it’ll trump whatever you’re subjected to the night after!